Ultimate Data Recovery will help you rescue your lost or inaccessible files from any imaginable data recovery disaster. Ultimate Data Recovery works by analyzing your disk on a bit-by-bit level. This means it sees things that regular Windows programs can't. It then uses it's built-in intelligence to spot deleted files... and then attempts to recover them, so you can work with them as normal. 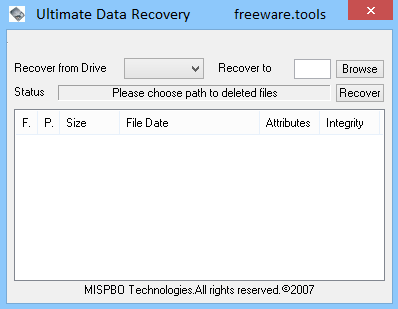 Ultimate Data Recovery will work with all your current disks.. As a general guide, if you can see it in Windows Explorer, you can use it with Ultimate Data Recovery - including FAT 12/16/32 and NTFS (including compressed and encrypted) partitions. Have you accidentally deleted important files from your hard drive, or your hard drive became corrupted, losing all or some of your important data, files, and folders? As long as your system's hardware is functional, award winning Ultimate Data Recovery may be an only solution you need for all your data recovery and undelete needs. With do-it-yourself data recovery product Ultimate Data Recovery you can quickly and easily restore your files saving your time, money and resources. Ultimate Data Recovery is a utility tool that can help you retrieve files which were previously lost or deleted from your computer. This is a portable program, so you don't have to install Ultimate Data Recovery. It means that you can place the software on an external drive and directly run its executable file on any computer. What's more important is that your Windows registry items will not be affected. The interface of the program is very plain and simple to navigate through. All you have to do is select the drive you want Ultimate Data Recovery to scan and initiate the process by clicking the "Recover" button. In the list you can check out the name, path, size, data, attributes and integrity of each file. Simply select the ones you want to recover and let Ultimate Data Recovery take care of the rest. Plus, you can specify the output destination. The biggest advantage of Ultimate Data Recovery is the fact that it barely uses system resources and is stable.